It was a blast to have had you on my Saturday B Movie Reel podcast to talk about this one. Thanks Dave. I saw this in college but I don't think I was prepared for how weird it is. Perhaps if I tried it again I'd get it. @Kevin: I, too, had a great time! Thanks for having me on. And everyone: Check out the link to Kevin's Saturday B Movie Reel Podcast...it's a lot of fun! @Robert: It's certainly weird, and I'm sure you're not the only one who's struggled with it, but definitely give it another chance! 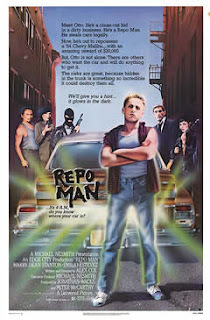 Repo Man reminds us that filmmaking is truly art and with the right imagination and creativity you can truly craft something very special and unique that nobody else can imitate.